Evil is getting stornger? I sure hope they would not kill the service. Access to LIFE’s Photo Archive — over 10 million images in total — will soon be available on a new hosted image service from Google, Time Inc. has announced. Ninety-seven percent of the photographs have never been seen by the public. The collection contains some of the most iconic images of the 20th century, including works from great photojournalists Alfred Eisenstaedt, Margaret Bourke-White, Gordon Parks, and W. Eugene Smith. These images can be found when conducting a search on Google.com or on Google Image Search. Users soon can also search through the LIFE Collection directly by visiting http://images.google.com/hosted/life. The LIFE Photo Archive featured on Google will be among the largest professional photography collections on the Web and one of the largest scanning projects ever undertaken. Millions of images have been scanned and made available on Google Image Search today with all 10 million images to be available in the coming months. All keywords are translated into 16 different languages. LIFE’s Photo Archive will be scanned and available on Google Image Search free for personal and research purposes. Copyright and ownership of all images will remain with Time Inc. In addition to housing some of the most important images taken by LIFE photographers, the LIFE Photo Archive also includes: The Zapruder film of the Kennedy assassination; The Mansell Collection from London; Dahlstrom glass plates of New York and environs from the 1880’s; Hugo Jaeger Nazi-era Germany 1937-1944; DMI red-carpet celebrity shots; Pix Inc. personalities; the entire works left to the Collection from LIFE photographers Alfred Eisenstaedt, Gjon Mili, and Nina Leen. 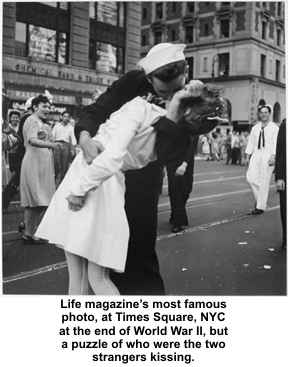 LIFE always set standards in photojournalism, until 1972 it was published weekly when it was unfortunately shut down. Six years later, in 1978 LIFE was published again. This time as a monthly magazine and according to Dirck Halstead, who wrote a very interesting article entitled The Last of LIFE, ” it was a pale imitation of its former self”. The monthly magazine was discontinued in 2000 only to be published again as a weekly newspaper supplement from 2004 to April 2007. The stealth search company Cuill is not stealthy about the $25mm it just took in from lead Madrone and others. Will we see a Google compeitor soon? I sure hope so! Google can be used for many things, the basis for an art exhibition isn’t one area that naturally comes to mind. A new art exhibition in Sydney asks Google who and what is “completely rooted” and displays the results. “Completely rooted” for those unfamiliar with the phrase is Australian slang for being in an unfortunate position, being tired (as in I’ve been running all day and I’m completely rooted) or may have sexual connotations. The formal meaning may refer to a belief structure (completely rooted in Christian tradition). To find inspiration for their works, 12 artists typed the words “completely rooted” into a Google search engine. From page two of the results, each artist selected one site as their sole inspiration. 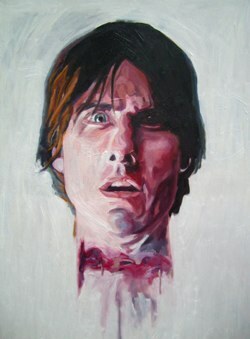 The inspired art includes the severed head of Tom Cruise and a skywriter writing Jesus in the sky. I’m not sure whether Google will soon become a common tool for artists seeking inspiration, but it’s certainly a new use for everyone’s favorite search engine. Highlights from the exhibition can be viewed online here. Spotted by Google Operating System is a new iPhone specific interface for Google’s personalized webpage product iGoogle. The page can accessed directly from http://google.com/ig/i , although iPhone users should be immediately redirected to this page when trying to access iGoogle. 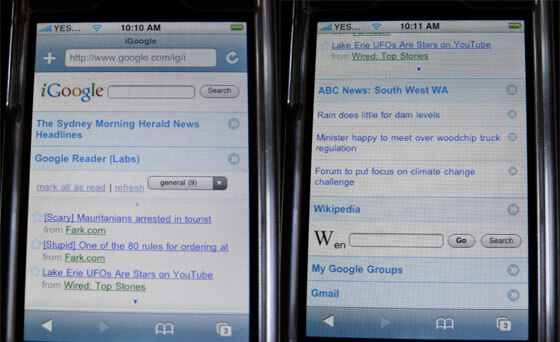 iGoogle for iPhone will compete with Netvibes, who launched their one iPhone specific version in August 2007. Google: Free IMAP for everyone! If you’ve been waiting impatiently for Google to roll out IMAP support for your account, it looks like the wait is over. Just two weeks after the first users started to notice a new IMAP option in their Gmail settings, Google says all Gmail users now have access to IMAP. You’ll need to use the English interface in order to see your IMAP settings. But Google plans to add the option to all languages in the next few weeks. Why does IMAP matter? Because unlike POP, IMAP supports back and forth communication between your offline email client and Gmail. If you set up your iPhone, Outlook, or Thunderbird client to read your Gmail using IMAP, every time you read a message it will be marked as read on the web interface. If you delete a message on your desktop, it will be deleted from the web. If you use POP, you’ll have to repeat all of those actions twice.